PA chairman says he doesn't want Israel's money if it will offset the payments to terrorists. 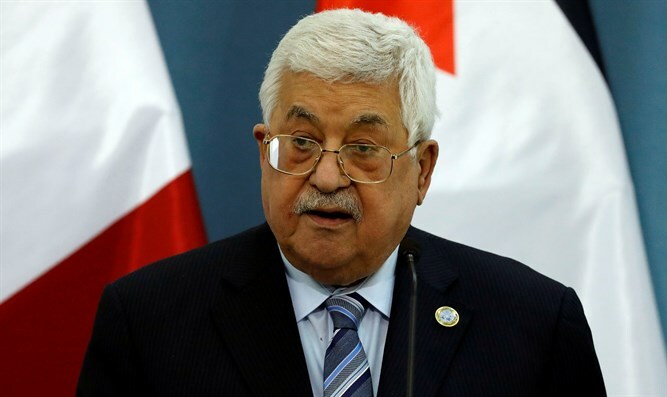 Palestinian Authority (PA) chairman Mahmoud Abbas responded on Tuesday evening to the Israeli Cabinet’s decision to implement the policy to offset the PA’s payments to terrorists. Under the law passed by the Knesset in July 2018, 507,697,000 shekels ($140,350,300) in tax revenue will be withheld from the PA.
"Israel claims that the Palestinian Authority transfers funds to terrorists and therefore wants to offset these funds," Abbas said in a speech, according to Channel 13 News. "So I say that we do not want to receive these funds and every penny we have - we will transfer to the families of the martyrs." PA officials have remained defiant and have made clear that the PA will never cease paying terrorists' salaries, threatening that Netanyahu would have to pay more if the salaries were deducted from the payments to the PA.
Abbas has in the past called the PA's continued payments to terrorists a "red line" that would not be halted under any circumstances. In his remarks on Tuesday, the PA chairman also said that the peace process with Israel is on the verge of collapse. “We are not interested in this because this is dangerous to the Middle East region," he insisted. Abbas also discussed the US peace efforts to achieve peace with Israel, which he has rejected before it has even been presented.